Side effects can include allergic reactions such as anaphylaxis, infection, and lung injury. Bacterial infections are relatively more common with platelets as they are stored at warmer temperatures. 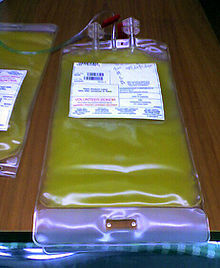 Platelets can be produced either from whole blood or by apheresis. They keep for up to five to seven days. Platelet transfusions came into medical use in the 1950s and 1960s. It is on the World Health Organization's List of Essential Medicines, the most effective and safe medicines needed in a health system. In the United Kingdom it costs the NHS about 200 pounds per unit. Some versions of platelets have had the white blood cells partially removed or been gamma irradiated which have specific benefits for certain populations. International guidelines recommend that platelets transfusions are given to people with reversible bone marrow failure to reduce the risk of spontaneous bleeding when the platelet count is less than 10 x 109/L. If the person is well using a higher platelet count threshold does not reduce the risk of bleeding further. A review in people with blood cancers receiving intensive chemotherapy or a stem cell transplant found that overall giving platelet transfusions when the platelet count is less than 10 x 109/L reduced the number of bleeding events and days with significant bleeding. However, this benefit was only seen in certain patient groups, and people undergoing an autologous stem cell transplant derived no obvious benefit. Despite prophylactic platelet transfusions, people with blood cancers often bleed, and other risk factors for bleeding such as inflammation and duration of thrombocytopenia should be considered. There is little evidence for the use of preventative platelet transfusions in people with chronic bone marrow failure, such as myelodysplasia or aplastic anemia. Multiple guidelines recommend prophylactic platelet transfusions are not used routinely in people with chronic bone marrow failure, and instead an individualised approach should be taken. Several studies have now assessed the benefit of using preventative platelet transfusions in adults with dengue who have profound thrombocytopenia (platelet count < 20 x 109/L. There is no evidence that this reduce the risk of bleeding, but there is evidence that they increase the risk of harm due to the platelet transfusion (increased risk of a transfusion reaction including anaphylaxis). A review in people with blood cancers receiving intensive chemotherapy or a stem cell transplant found that overall giving platelet transfusions when the platelet count is less than 10 x 109/L compared to giving platelet transfusions when the platelet count is less than 20 or 30 x 109/L had no effect on the risk of bleeding. Higher platelet transfusion thresholds have been used in premature neonates, but this has been based on limited evidence. There is now evidence that using a high platelet count threshold (50 x 109/L) increases the risk of death or bleeding compared to a lower platelet count threshold (25 x 109/L) in premature neonates. A review in people with blood cancers compared different platelet transfusion doses. This review found no difference in the number of people who had clinically significant bleeding between platelet transfusions that contained a small number of platelets (low dose – 1.1 x 1011/m2) and those that contained an intermediate number of platelets (intermediate dose – 2.2 x 1011/m2). This review also found no difference in the number of people who had clinically significant bleeding between platelet transfusions that contained a small number of platelets and those that contained a large number of platelets (high dose – 4.4 x 1011/m2). One of the review's included studies reported on transfusion reactions. This study’s authors suggested that a high-dose platelet transfusion strategy may lead to a higher rate of transfusion-related adverse events. In people with a low platelet count, prophylactic platelet transfusions do not need to be given prior to procedures that have a low risk of causing bleeding. Low-risk procedures include surgical sites that do not contain many blood vessels e.g. cataract surgery, or minor procedures. Guidelines recommend that it is safe to perform central venous catheter insertion when the platelet count is 20 x 109/L or above. The evidence for this is based on observational studies in which bleeding occurred due to procedure error rather than due to the platelet count. Platelet transfusion thresholds for more major procedures are based on expert opinion alone. Guidelines recommend a threshold of 50 x 109/L for major surgery and a threshold of 100 x 109/L for surgery on the brain or the back of the eye. There is little evidence for the effectiveness of platelet transfusions or the optimal dose when a person with a low platelet count is actively bleeding. Current recommendations are based on consensus guidelines from around the world. Side effects can include allergic reactions such as anaphylaxis, infection, and lung injury. Bacterial infections are relatively more common with platelets as they are stored at warmer temperatures. People with hematological disorders or cancer receive the largest proportion of platelet transfusions. Most are given to prevent bleeding during treatment with chemotherapy or stem cell transplant. Much of the remainder are used in general medicine, cardiac surgery and in intensive care. Unlike other blood products demand for platelet transfusions appears to be increasing in several countries around the world. An ageing population, an increase in the number of people with blood cancer, and changes to the management of these cancers are likely the major reasons for the rise in demand for platelets. Since 1990, the number of stem cell transplants performed in Europe has risen from 4,200 to over 40,000 annually. Platelet transfusions came into medical use in the 1950s and 1960s. It is on the World Health Organization's List of Essential Medicines, the most effective and safe medicines needed in a health system. In the United Kingdom it costs the NHS about 200 pounds per unit. Platelets can be produced either from whole blood donations or by apheresis. They keep for up to five to seven days. Platelet components can have had the white blood cells partially removed (leucodepleted) which decreases the risk of having a transfusion reaction. They can be treated with ultraviolet light which decreases the risk of transmission of certain infections. [needs update] They can be gamma irradiated which have specific benefits for certain populations (those at risk of transfusion-associated graft versus host disease). ^ a b c d e f g h Hillyer CD (2007). Blood Banking and Transfusion Medicine: Basic Principles & Practice. Elsevier Health Sciences. pp. 308–310. ISBN 978-0443069819. Archived from the original on 2017-01-12. ^ a b c d e f g Connell NT (December 2016). "Transfusion Medicine". Primary Care. 43 (4): 651–659. doi:10.1016/j.pop.2016.07.004. PMID 27866583. ^ Josephson CD, Castillejo MI, Grima K, Hillyer CD (February 2010). "ABO-mismatched platelet transfusions: strategies to mitigate patient exposure to naturally occurring hemolytic antibodies". Transfusion and Apheresis Science. 42 (1): 83–8. doi:10.1016/j.transci.2009.10.013. PMID 20034854. ^ Linton AD (2015). Introduction to Medical-Surgical Nursing. Elsevier Health Sciences. p. 287. ISBN 9781455776412. Archived from the original on 2017-01-12. ^ Das PC, Smit-Sibinga CT, Halie MR (2012). Supportive therapy in haematology. Springer Science & Business Media. p. 190. ISBN 9781461325772. Archived from the original on 2017-01-10. ^ a b "WHO Model List of Essential Medicines (19th List)" (PDF). World Health Organization. April 2015. Archived (PDF) from the original on 13 December 2016. Retrieved 8 December 2016. ^ a b Yentis SM, Hirsch NP, Ip J (2013). Anaesthesia and Intensive Care A–Z: An Encyclopedia of Principles and Practice. Elsevier Health Sciences. p. 147. ISBN 9780702053757. Archived from the original on 2017-01-12. ^ a b Hillyer CD (2007). Blood Banking and Transfusion Medicine: Basic Principles & Practice. Elsevier Health Sciences. p. 320. ISBN 978-0443069819. Archived from the original on 2017-01-12. ^ a b c d Kaufman RM, Djulbegovic B, Gernsheimer T, Kleinman S, Tinmouth AT, Capocelli KE, et al. (February 2015). "Platelet transfusion: a clinical practice guideline from the AABB". Annals of Internal Medicine. 162 (3): 205–13. doi:10.7326/M14-1589. PMID 25383671. ^ a b c d e f "Blood transfusion | Guidance and guidelines | NICE". www.nice.org.uk. Archived from the original on 2016-01-16. Retrieved 2016-01-21. ^ a b c "Patient Blood Management Guidelines | National Blood Authority". www.blood.gov.au. Archived from the original on 2016-01-15. Retrieved 2016-01-21. ^ Schiffer, Charles A.; Bohlke, Kari; Delaney, Meghan; Hume, Heather; Magdalinski, Anthony J.; McCullough, Jeffrey J.; Omel, James L.; Rainey, John M.; Rebulla, Paolo; Rowley, Scott D.; Troner, Michael B.; Anderson, Kenneth C. (2018). "Platelet Transfusion for Patients With Cancer: American Society of Clinical Oncology Clinical Practice Guideline Update". Journal of Clinical Oncology. 36 (3): 283–299. doi:10.1200/jco.2017.76.1734. PMID 29182495. ^ a b c d e f g h i Estcourt LJ, Birchall J, Allard S, Bassey SJ, Hersey P, Kerr JP, et al. (February 2017). "Guidelines for the use of platelet transfusions". British Journal of Haematology. 176 (3): 365–394. doi:10.1111/bjh.14423. PMID 28009056. ^ a b Estcourt LJ, Stanworth SJ, Doree C, Hopewell S, Trivella M, Murphy MF (November 2015). "Comparison of different platelet count thresholds to guide administration of prophylactic platelet transfusion for preventing bleeding in people with haematological disorders after myelosuppressive chemotherapy or stem cell transplantation". The Cochrane Database of Systematic Reviews (11): CD010983. doi:10.1002/14651858.cd010983.pub2. PMC 4717525. PMID 26576687. ^ a b Crighton GL, Estcourt LJ, Wood EM, Trivella M, Doree C, Stanworth S (September 2015). "A therapeutic-only versus prophylactic platelet transfusion strategy for preventing bleeding in patients with haematological disorders after myelosuppressive chemotherapy or stem cell transplantation". The Cochrane Database of Systematic Reviews. 9 (9): CD010981. doi:10.1002/14651858.CD010981.pub2. PMC 4610062. PMID 26422767. ^ Malouf R, Ashraf A, Hadjinicolaou AV, Doree C, Hopewell S, Estcourt LJ (May 2018). "Comparison of a therapeutic-only versus prophylactic platelet transfusion policy for people with congenital or acquired bone marrow failure disorders". The Cochrane Database of Systematic Reviews. 5: CD012342. doi:10.1002/14651858.cd012342.pub2. PMC 5985156. PMID 29758592. ^ a b Khan Assir MZ (April 2017). "Time to stop prophylactic platelet transfusion for adult dengue". Lancet. 389 (10079): 1583–1584. doi:10.1016/s0140-6736(17)30545-7. PMID 28283287. ^ New HV, Berryman J, Bolton-Maggs PH, Cantwell C, Chalmers EA, Davies T, et al. (December 2016). "Guidelines on transfusion for fetuses, neonates and older children". British Journal of Haematology. 175 (5): 784–828. doi:10.1111/bjh.14233. PMID 27861734. ^ Curley A, Stanworth SJ, Willoughby K, Fustolo-Gunnink SF, Venkatesh V, Hudson C, et al. (November 2018). "Randomized Trial of Platelet-Transfusion Thresholds in Neonates". The New England Journal of Medicine. 380 (3): 242–251. doi:10.1056/nejmoa1807320. PMID 30387697. ^ a b Estcourt LJ, Stanworth S, Doree C, Trivella M, Hopewell S, Blanco P, Murphy MF (October 2015). "Different doses of prophylactic platelet transfusion for preventing bleeding in people with haematological disorders after myelosuppressive chemotherapy or stem cell transplantation". The Cochrane Database of Systematic Reviews. 10 (10): CD010984. doi:10.1002/14651858.CD010984.pub2. PMC 4724938. PMID 26505729. ^ Kaufman RM, Assmann SF, Triulzi DJ, Strauss RG, Ness P, Granger S, Slichter SJ (January 2015). "Transfusion-related adverse events in the Platelet Dose study". Transfusion. 55 (1): 144–53. doi:10.1111/trf.12791. PMC 4293226. PMID 25065959. ^ Estcourt LJ, Desborough M, Hopewell S, Doree C, Stanworth SJ (December 2015). "Comparison of different platelet transfusion thresholds prior to insertion of central lines in patients with thrombocytopenia". The Cochrane Database of Systematic Reviews (12): CD011771. doi:10.1002/14651858.cd011771.pub2. PMC 4755335. PMID 26627708. ^ Estcourt LJ, Malouf R, Doree C, Trivella M, Hopewell S, Birchall J (September 2018). "Prophylactic platelet transfusions prior to surgery for people with a low platelet count". The Cochrane Database of Systematic Reviews. 9: CD012779. doi:10.1002/14651858.cd012779.pub2. PMID 30221749. ^ a b c Estcourt LJ (October 2014). "Why has demand for platelet components increased? A review". Transfusion Medicine. 24 (5): 260–8. doi:10.1111/tme.12155. PMID 25327286. ^ a b c Charlton A, Wallis J, Robertson J, Watson D, Iqbal A, Tinegate H (August 2014). "Where did platelets go in 2012? A survey of platelet transfusion practice in the North of England". Transfusion Medicine. 24 (4): 213–8. doi:10.1111/tme.12126. PMID 24957661. ^ a b c Cameron B, Rock G, Olberg B, Neurath D (February 2007). "Evaluation of platelet transfusion triggers in a tertiary-care hospital". Transfusion. 47 (2): 206–11. doi:10.1111/j.1537-2995.2007.01090.x. PMID 17302765. ^ a b Whitaker BI, Rajbhandary S, Harris A (2015). The 2013 AABB Blood Collection, Utilization, and Patient Blood Management Survey Report. AABB. Archived from the original on 2016-01-26. ^ Passweg JR, Baldomero H, Bader P, Basak GW, Bonini C, Duarte R, et al. (September 2018). "Is the use of unrelated donor transplantation leveling off in Europe? The 2016 European Society for Blood and Marrow Transplant activity survey report". Bone Marrow Transplantation. 53 (9): 1139–1148. doi:10.1038/s41409-018-0153-1. PMC 6128821. PMID 29540849. ^ "FAQ: Leucodepletion of red cells and platelets". transfusion.com.au. 14 December 2015. Archived from the original on 13 July 2017. Retrieved 18 July 2017. ^ Butler C, Doree C, Estcourt LJ, Trivella M, Hopewell S, Brunskill SJ, Stanworth S, Murphy MF (March 2013). "Pathogen-reduced platelets for the prevention of bleeding". The Cochrane Database of Systematic Reviews (3): CD009072. doi:10.1002/14651858.cd009072.pub2. PMC 5558872. PMID 23543569. Platelet Transfusion: A Clinical Practice Guideline From the AABB Guideline from the American Association of Blood Banks published 2015. Australian Patient Blood Management Guidelines.